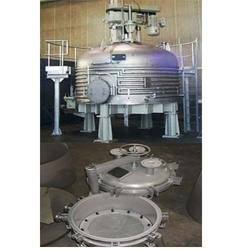 We offer to the customers a high quality of Nutsche Filter which are used for separating the solid from the liquid and these products are manufactured and supplied to the customers all over the globe. These Nutsche Filters are prepared using high quality tested components and are available in varied capacities, models and sizes. Available in customized specifications, these Nutsche Filters are offered at industry leading prices. Nutsche Filters are one of reputed products on offer and is highly sought after owing to its superior quality, high performance and low maintenance. The Nutsche Filters are widely used across various applications areas such as dye chemicals - dyestuffs, pigments, intermediates and chemicals - basic chemicals, organic inorganic, phosphoric compounds, resin, marine chemicals. These Nutsche Filters are offered at highly competitive prices and widely accepted. Looking for Nutsche Filter ?